Summary: The main objectives of the project where the optimization of the air curtain discharge plenum. Focusing on a better orientation of the curtain jet and a decrease of the turbulence level of the flow. Hence, obtaining a better energy efficiency product. Furthermore, multijet air curtain where also optimized. 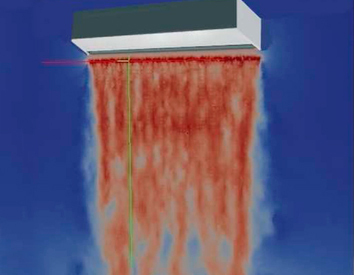 In order to deliver an optimal design of the air curtains, extensive LES simulation of Airtècnic’s prototypes using TermoFluids technology and the UPC HPC facilities have been curried out. Moreover, experimental validation of the numerical results have been also successfully achieved.